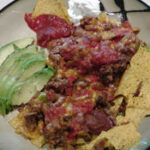 Optional: If you are adding meat to your nachos recipe, the first thing to do would be to break it apart in chunks, season it and brown it until no pink is left. The meat won’t have much time to cook in the oven, so make sure it’s cooked properly at this point. Remove from the burner and put aside for now. 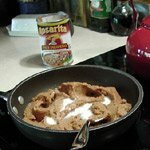 Heat (warm) the refried beans. We add a little bit of milk to make them creamier and more “spreadable”. Lay out your chips on a baking sheet, single layer as much as possible. First veggies, then shredded cheddar cheese, then meat, then beans, then more cheese on top. Watch closely while you broil the nachos. It should only take a few minutes or so. The cheese should be melted and the chips around the edges should be toasted. Additionally, you can “toast” extra chips in the broiler to add on the side. There will be plenty of toppings to scoop up! There you go! All done. I hope you enjoy this nachos recipe as much as we do!